Art Reactor, a new artist-run gallery/workshop/studio space at 5614 Baltimore Avenue, Hyattsville, Maryland, 20781, is currently hosting its first curated exhibit. The show, entitled The Whole Plate Project, is an exhibit of photographs made in the whole plate format, using a variety of historic and contemporary materials. Whole plate as a size is defined as 6.5 by 8.5 inches - it is the original format as used by Louis Daguerre for his polished silver plates in the first photographs of 1839. Whole plate as a format has had a long and varied history, coming in and out of fashion with each major wave of photographic innovation. The work in this show relates historic process and practice to modern issues, anxieties and imagery. Work featured includes wet-plate collodion, hand-crafted silver gelatin prints, platinum/palladium, cyanotype and silver-gelatin prints on contemporary commercial papers. The exhibit features work by eight artists from across the US, Canada, and Germany - Scott Davis, Quinn Jacobson, Diane Maher, Chris Rini, Denise Ross, Barry Schmetter, Heather Wetzel and David William White. including two artists from the Washington DC metro area, Scott Davis and Barry Schmetter. The exhibit runs from August 9 to September 10. Art Reactor will be open August 27th from 7-9 PM for a reception with light refreshments. Regular open hours will be held Saturday the 28th from 10am to 4pm and September 4 and 5 from 10-4. The space will also be open by appointment weekdays after 7pm or any other unscheduled time on weekends. Nevin Martell has a terrific piece in the WCP about DC area super photographer John Gossage. He wasn’t yet 18 when he had his first show in New York. Since then, he’s exhibited at the Museum of Modern Art in New York, D.C.’s Corcoran Gallery of Art, and Hannover, Germany’s Sprengel Museum, and shared wall space with Jasper Johns and others. In September, his well-known series The Pond, which documents an unidentified, Walden-esque body of water somewhere near Baltimore, will be displayed in its entirety for the first time at the Smithsonian American Art Museum. It was published as a book in 1985. Read Martell's really excellent article here. Today (we think) marks the 1288th anniversary of the Battle of Covadonga, the historic event that stopped the tide of the Islamic invasion of Spain and turned back the Arabic armies in what became the Reconquista of Spain. 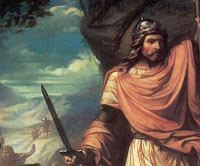 It is said by Arab historians that with Pelayo (Pelagius, 681-737) as their leader, the combined Gothic, Celtic and Asturian Christian armies under Pelayo, a son of Favila, who had been a noble at the court of the Visigoth King Egica, (687-700), and had established his headquarters at Cangas de Onís, in Asturias, united the various northern peoples of Iberia (the Celts in Galicia and Asturias and the former ruler Visigoths) and began an uprising against the advancing Umayyad Muslims, who had defeated and killed Rodrigo (Roderick) the last Gothic King of Spain. On this day, in either 722 or 721, the ten-year-old Islamic invasion of western Europe was turned around as Pelayo defeated the Islamic armies and the battle assured the independence of the most ancient Kingdom of Asturias, and it is that kingdom's survival which eventually became the kernel of new thrust that reconquered the westernmost European peninsula and became the modern nation of Spain. Freedom does not come easy. "Guillermo Kuitca: Everything, Paintings and Works on Paper, 1980-2008," on view Oct. 21-Jan. 16, 2011, at the Hirshhorn will present over 45 canvases and 25 works on paper, spanning the Argentinean artist's career. "Part of the Hirshhorn's commitment to international contemporary art has always been a focus on the artists of Latin America," said Kerry Brougher, the museum's deputy director and chief curator. "The Hirshhorn acquired its first work by Kuitca back in 1995, when he was still an emerging figure, and we have watched his reputation continue to grow ever since. We are pleased to have co-organized this retrospective and to be able to present the full spectrum of this insightful artist's work in Washington, and we look forward to the upcoming year featuring exhibitions with some of the most influential Latin American artists of our time." The exhibition is the first comprehensive survey of the artist's work in the United States in more than 10 years and is co-organized by the Hirshhorn, Albright-Knox Art Gallery in Buffalo, N.Y., and Miami Art Museum in Miami, Fla. Here's the odd thing to me. For at least five or six years I've had not one, but two art collectors who are retiring and in the process of donating most of their collection. I've tried every angle that I know to donate some of their Latin American artists, specifically Sandra Ramos, to the Hirshhorn. They continue to decline to accept the gift, and that is their right, but what puzzles me is that other museums (MoMA, Dallas, MFA Boston, Miami) have all recognized the inherent value of accepting a Ramos donation now -- before the Castro brothers finally died and Cuba returns to the list of free nations -- rather than later. And now Kerry Brougher highlights a "focus on the artists of Latin America" (news to me), which makes their declining of a gift by one of Latin America's most celebrated Cuban artists a puzzle. Especially when other museums all over the US are jumping on the offers. I realize that I am far from objective on this issue, but it is still a puzzle to me. By the way, the last Sandra Ramos work that I offered the Hirshhorn as a gift has now been gifted to the permanent collection of the Miami Art Museum. It has nothing to do with art, but I've been meaning to mention this for a while. I love fresh fish and the key fish place around here is Atlantic Supermarket (7901 New Hampshire Avenue, Hyattsville, MD 20783-4609, (301) 439-7005). Loads of fresh fish in their fish department, including many species not generally available in your regular supermarket. Today I bought Mahi Mahi for $2.99 a pound and it's not frozen, but on ice and the guy cleans it right in front of you. I also bought a fish that I'd never heard of called Basa. I got it just to try it (and because it was very cheap). Having just come back from Miami, I was hoping to find Mamey ice cream, which (in my opinion) is the best tropical fruit ice cream on the planet. They didn't have it (in fact they don't have much ice creams). I'll keep looking for Mamey (called Zapote in the Oriente province of Cuba) ice cream. They even sell it at Safeway in Miami, so maybe my local Safeway can order it for me.